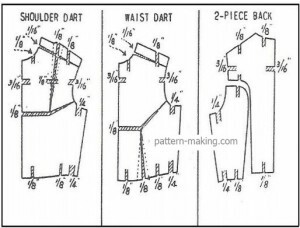 chart shows where and how much pattern is graded from size 16 to 18. the grade of th waist length is similar to the grade of the kimono sleeve pattern. 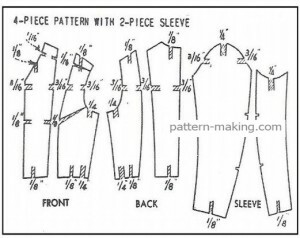 the entire 1/4” grade is made near the top of the front and back and a corresponding grade at the top of the sleeve. 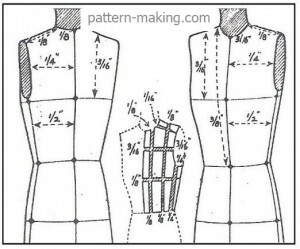 for the junior sizes, from 13 to 15, or 15 to 17, etc., the grade is the same as shown in the chart, the only difference being an extra grade of 1/4” between the armhole and the waistline in front and back sections. this would account for the 1/2” grade in the waist length, between the neck and the waistline. for ladies sizes, see directions above for the kimono sleeve. grade from 16 to 36 chart shows where and how much pattern is increased from 16 to 36. the extra grade of 1/8” increases the size of the side dart. 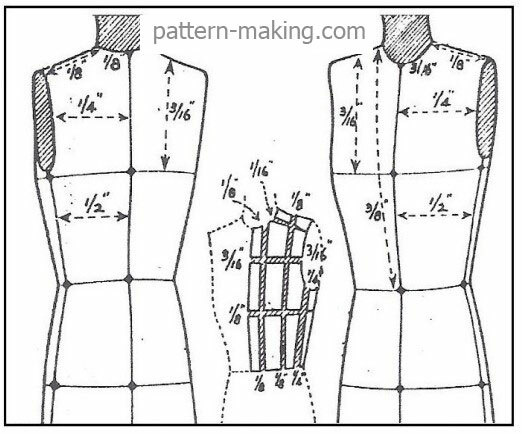 this also provides the necessary grade of 5/8” from shoulder to waistline in the front, there being 1/16” at shoulder (when the neck is raised 1/16”). 3/16” at the armhole, 1/8” at the bust line, and 1/4” between the dart and the waistline. the sleeve grade is very much the same as from 16 to 18, the difference being 3/16” grade in the cap height instead of 1/8”. grading 16 (regular) to 16 ½ (half size) the differences between the regular and the half size figures is mainly in the height, the regular size figure measuring 5 feet 7” or 8” in height, and the half size about 5 feet 3”. garments designed for the shorter women (trade term is half sizes) are made about 3” shorter than the garments for the standard regular sizes; that is 1” shorter above the waistline and 2” shorter below the hip. the hip of the half size figure is about 1” to 2” larger, and the waistline about 1” larger, than the regular size figure. the arm is about 1” shorter. 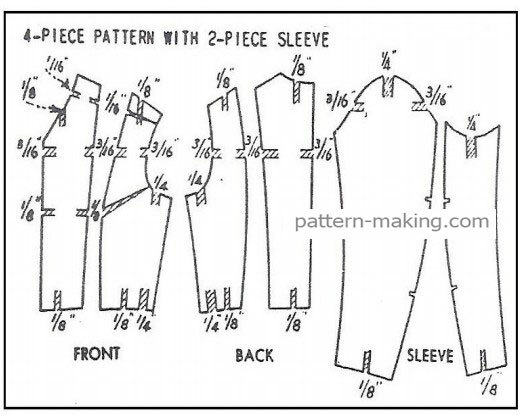 grading from regular to half size chart shows where and how much pattern is graded from regular to half size. 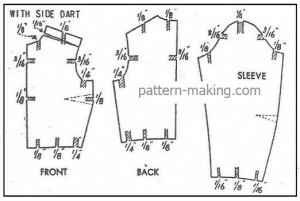 this method may be applied to grading patterns from 16 to 16 ½, 36 to 36 ½, or 13 to 13 ½. for instance: if a style is designed in the regular misses, ladies or junior sizes, and the same style may be suitable for shorter women, a half size pattern is then made by grading from the regular to the half size, making the pattern shorter proportionately, and larger in the hip and waistline, as shown in this chart. 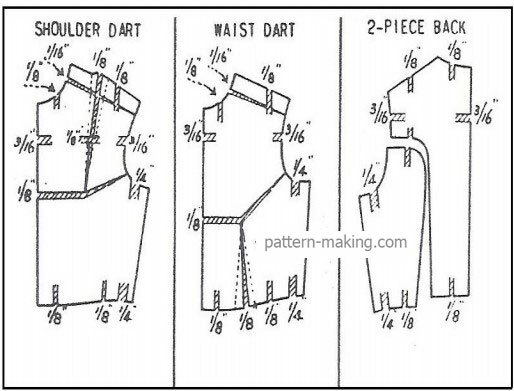 once the half is established, the pattern may be graded to the other required sizes as follows: for the misses half sizes 14 ½, 16 ½ , 18 ½, etc. for the ladies half sizes 36 ½, 38 ½, 40 ½, 42 ½, etc. for the juniors half sizes 13 ½, 15 ½, 17 ½, etc. 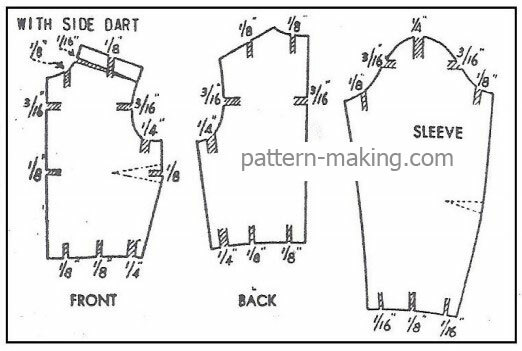 the method of grading the pattern from 16 ½ to18 ½, or 36 ½ to 38 ½, or 13 ½ to 15 ½, is the same as the grade from 16 to 18, 36 to 38 or 13 to 15, respectively.